Today I've still been recovering from the total shock over the death of a friend and colleague, Greg Miller. Brutally murdered is not how I want to remember this kind, and often cantankerous man who was my boss for 11.5 years. My head is still not around this. 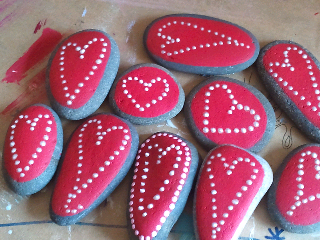 Painting hearts is just about all I had the energy for. Happy Valentines day! Love these...so vibrant! Very sorry to hear about your friend, it sound like a terrible tragedy. Wow, life is so, well, so real.